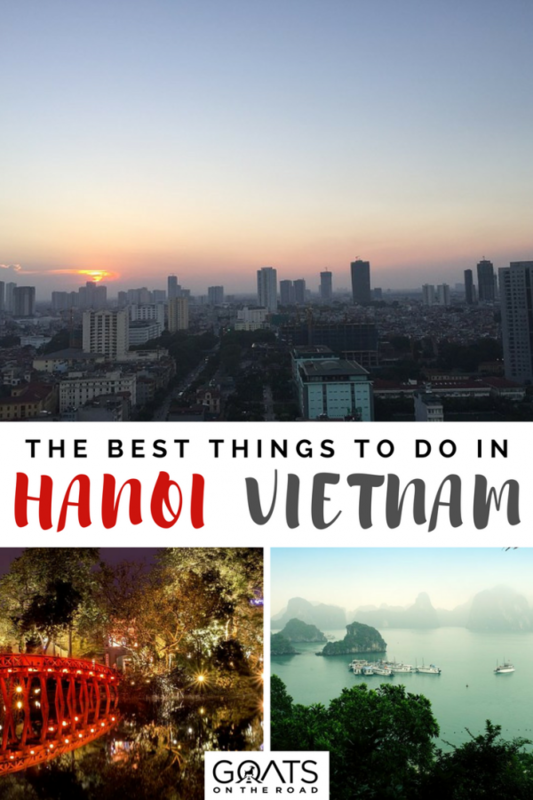 There is a never ending list of things to do in Hanoi, Vietnam’s capital city. This enchanting place has carved its way through history, overcoming everything that has been thrown at it. Hanoi has withheld the barrage of the Indo-Chinese armies, the French colonial era and also survived the Vietnam War. Today this incredible city has a spectacular mix of both the archaic and the modern. It’s this wonderful combination, plus all of the other countless things to do in Hanoi, which makes visiting the city such a joy. 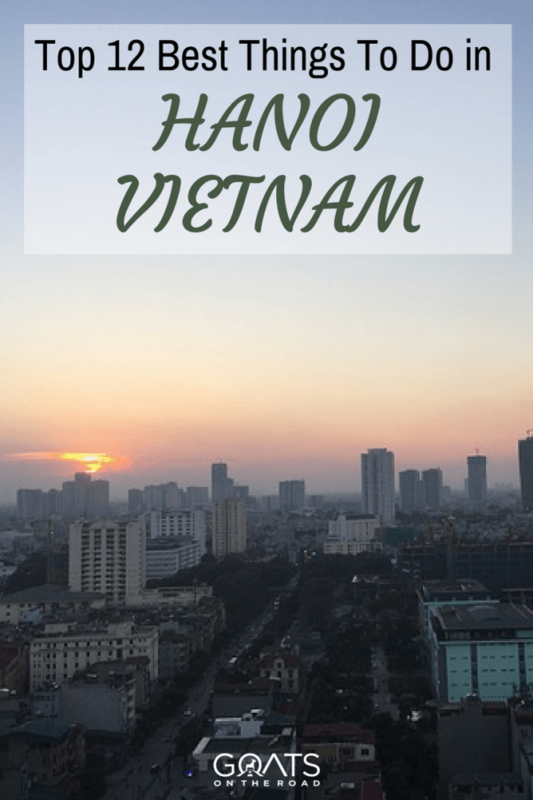 If you’re wondering where to go in Vietnam, make sure Hanoi is on your list! Here are the 12 best things to do in Hanoi, Vietnam. 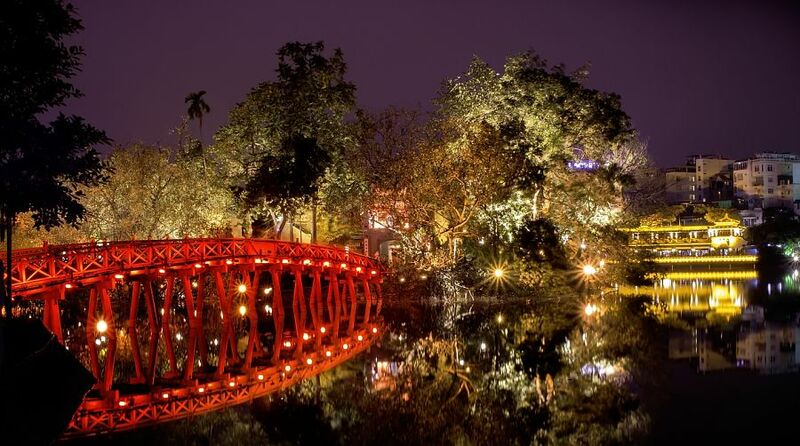 Also known as Turtle Lake, Hoan Kiem Lake is situated in the heart of the Old Quarter of Hanoi. This area is a huge draw for tourists, with many great bars, restaurants and markets. 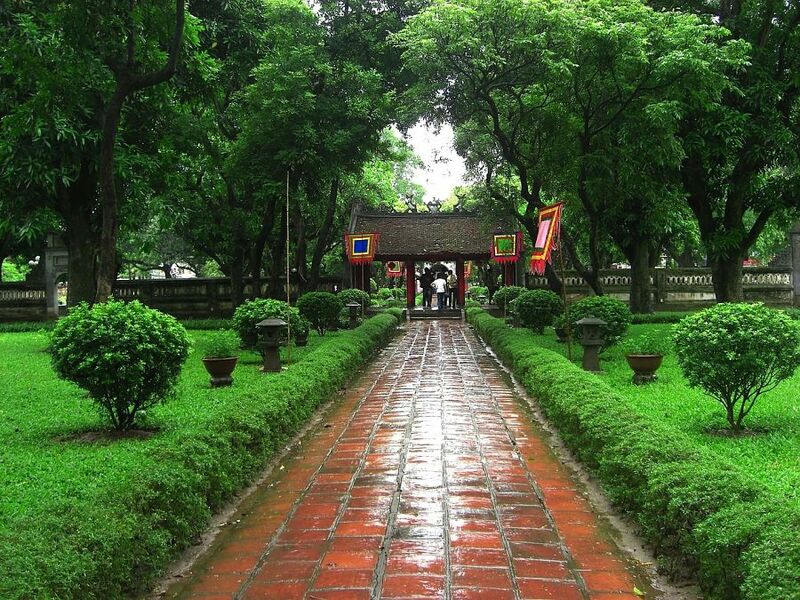 Hoan Kiem Lake is also home to Ngoc Son Temple which is located on a small island in the lake. The only way to reach Ngoc Son Temple is by a beautiful red Chinese bridge which leaps from the shore to the island. 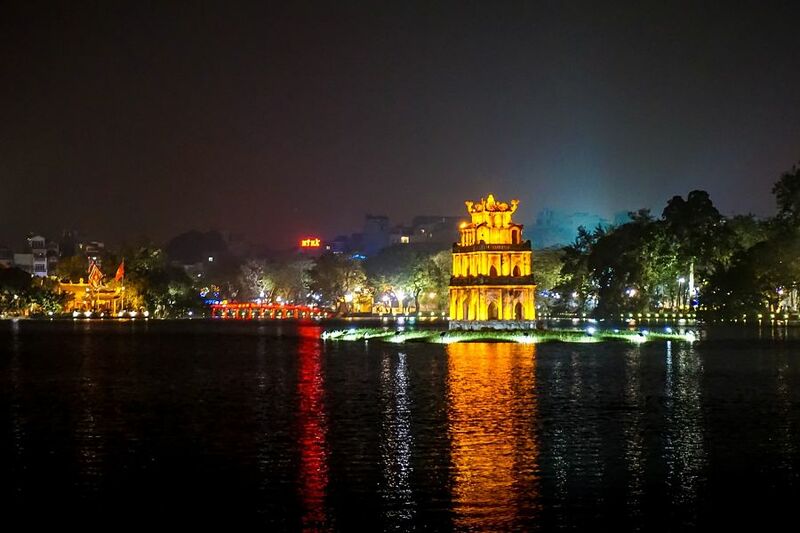 The exciting atmosphere in this beautiful part of the city is what makes a tour around the lake one of the best things to do in Hanoi. Next up is the Ho Chi Minh Mausoleum. Ho Chi Minh will forever be etched into Vietnamese history. He is remembered as the savior of his people, which explains the reverence with which he is held. Ho Chi Minh was the first communist ruler of Vietnam, defeating the French during the colonial era in 1954. Modeled after the tomb of Lenin of Russia, visitors can now see the body of Ho Chi Minh preserved for eternity in a coffin of glass. The grounds around this immense Mausoleum are really worth exploring and should definitely be on your list of things to do in Hanoi. You will never forget the friendliness of the people of Hanoi and the hospitality that they show you. But first of all, you’re probably wondering what Beer Hoi actually is. 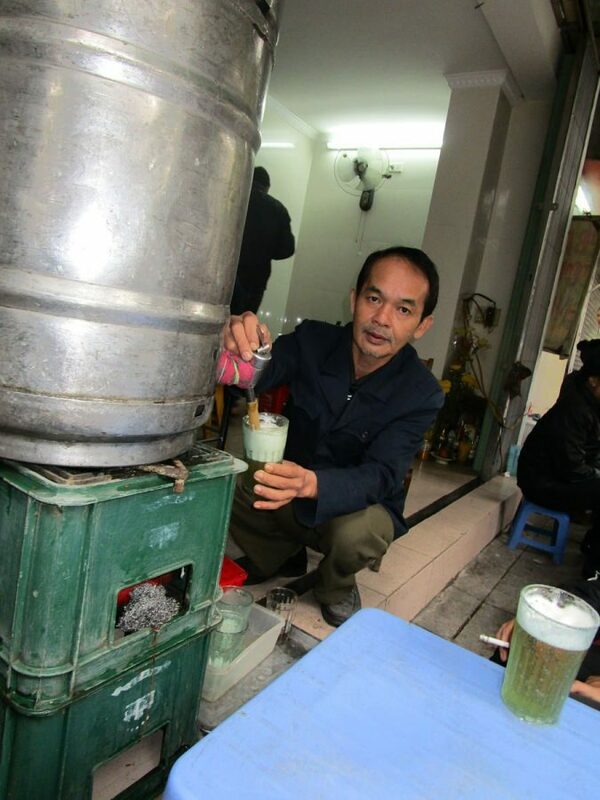 Hanoi’s most famous drink, Beer Hoi, is a light beer which is brewed daily by locals throughout the city. The beer only stays drinkable for around 24 hours and is only 2% proof. It also costs roughly 30 US cents and is known as one of the cheapest beers in the world. Everywhere in Hanoi you’ll pass little shops which sell Beer Hoi. You’ll probably pass the same customers in the same shops each day, and it’s well worth taking a seat to join them. They’ll be extremely friendly, probably offering you their food and chatting away in Vietnamese. Though you may not understand a word that each other says, it will no doubt form some of your fondest memories of the city. You should definitely add this to your list of things to do in Hanoi. The imperial citadel of Thang Long is a must-see when visiting the city. This UNESCO protected world heritage site once stood at the centre of ancient Hanoi and is still spectacular to see, even to this day. For an incredible thirteen centuries the citadel has stood as the heart of northern Vietnam and was once the capital of the country. 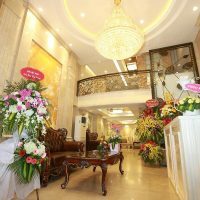 Located in the Ba Dinh district of Hanoi, the Citadel is open 7 days a week from 8:00 am until 7:30 pm. A good way to see the citadel of Hanoi is by combining your visit with the Mausoleum of Ho Chi Minh which is close by. Hoa Lo Prison has a dark and foreboding history. 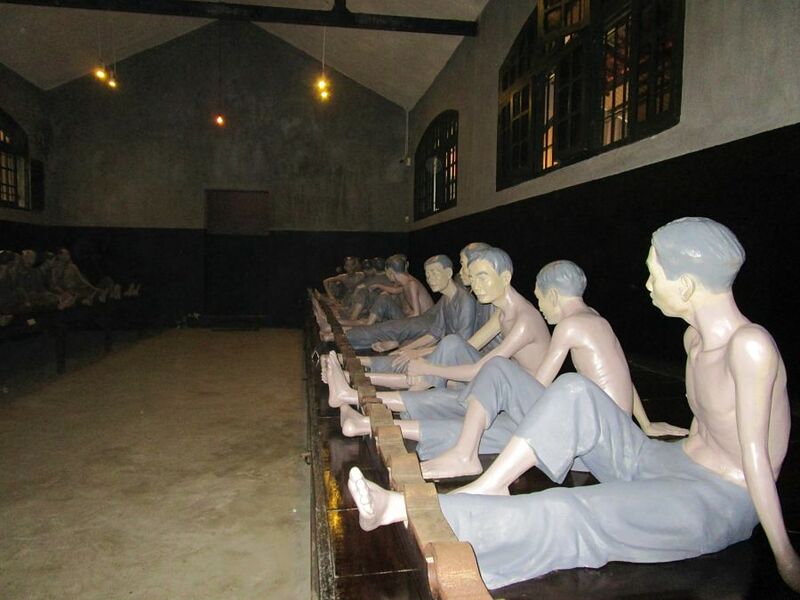 First built in the late 1800’s by the French, the prison was used to house Vietnamese political prisoners. Later in its history the prison would become known by another name, the dreaded Hanoi Hilton. Used by the northern Vietnamese to house American POW’s during the war, today only the gatehouse of Hoa Lo Prison remains. The remaining structures have been transformed into a museum where tourists stroll this once nightmarish place. Hoa Lo prison is open to visitors 7 days a week from 8:00 am until 5:00 pm and will take approximately one hour to explore. Modelled after the famous opera house of Paris, the Opera House of Hanoi is the most exquisitely beautiful building in the city. The Opera House is located in the French quarter of the city and was built in 1911 during the French invasion of Vietnam. Although the building fell into decline after the departure of the French, 1997 saw the rejuvenation of the Opera House which brought the ruined building back to its former grandiose appearance. Today regular shows are held at the Opera House showcasing the absolute best of Vietnamese Opera, Dance and Ballet. For those who love the arts, a trip to the Opera House is a must. 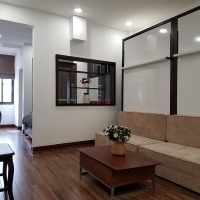 Here is a list of the top 3 rated, affordable properties in Hanoi. Click on the links and check them out for yourself! This beautiful temple complex in the heart of Hanoi was built over 1000 years ago, dedicated to the teachings of Confucius. Over the centuries the complex has slowly grown and today is a beautiful park covered in temples, shrines and gardens. The Temple of Literature is also home to the Imperial Academy which was Vietnam’s first national University. Still to this day, graduating doctors visit the Temple of Literature after their graduation. The Temple and gardens are open every day until 4:30pm except for Mondays. Hanoi is famous for its water puppet shows, with several theatres showing daily performances. The most famous water puppet theatre is Thang Long Theatre, which is located next to Hoan Kiem Lake. Thang Long Theatre hosts five water puppet shows a day, often selling out every seat in the theatre. Here puppets dance and slide over the water filled stage, operated by a team of expert puppeteers. Here at Thang Long Theatre, most shows tell the Vietnamese legend of the Turtle and Hoan Kiem Lake. As stated, Thang Long Theatre holds shows seven days a week, five times a day. 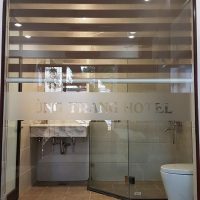 Do not miss this slightly wacky entry on the list of things to do in Hanoi. By now you should have realised that if you are visiting Hanoi, the Old Quarter is the place to be. 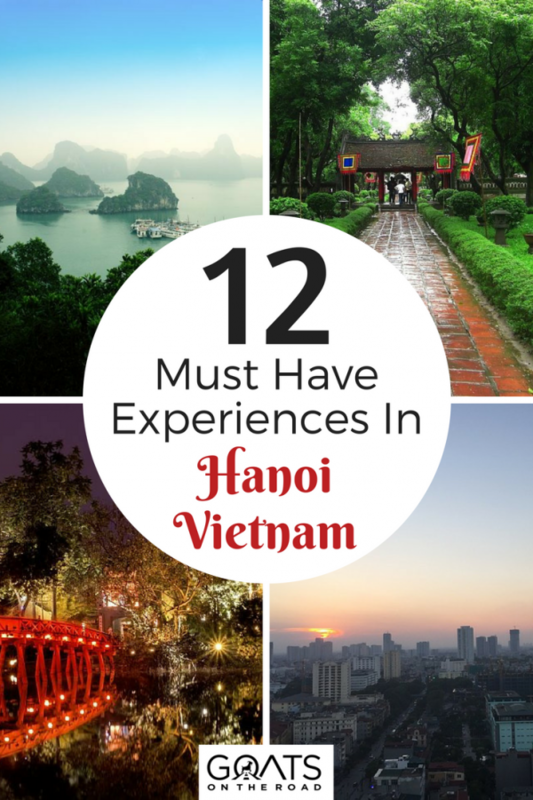 Many of the entries on this list are based in the Old Quater of Hanoi. This crazy, charming place is a bustling hub of attractions, restaurants and shops and one of those rare places in the world where you can happily get lost. 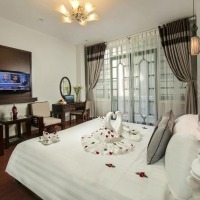 When you are visiting Hanoi, make sure to stay in this area, as this is the “traveler’s hub” of the city. Also this is where the best nightlife is to be found. The Old Quarter of Hanoi will not disappoint and will keep you entertained throughout your stay. Next up is another of Hanoi’s little wonders, Tran Quoc Pagoda. This ancient place is the oldest temple in all of Hanoi. It was first constructed in the 6th century by the Emperor Ly Nam De, making the Pagoda almost 1500 years old. Tran Quoc Pagoda is located on an island in the city’s West Lake near its southeastern shore. Due to the beauty of not just the Pagoda but also West Lake itself, many Buddhists from around the world travel here to meditate in its presence. Tran Quoc Pagoda is open daily for tourists and admission to the site is free. 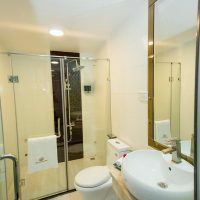 The next entry on the list of things to do in Hanoi is one which is known throughout the world. 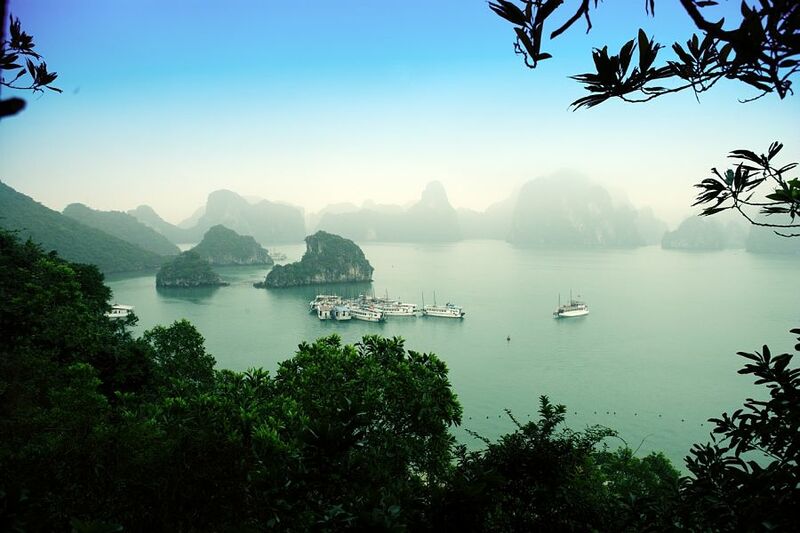 The majestic Halong Bay is one of the most stunning places you will ever see. Although technically not in Hanoi, most of the tours to the bay leave from this city. 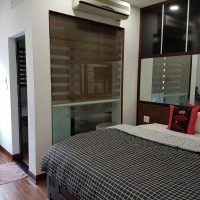 It is possible to leave Hanoi in the morning, drive to Halong Bay and take your tour, then be back in Hanoi for the evening. However, I would recommend taking a two-day, one-night tour in order to get a better feel of the bay. If you would like to learn more about taking a tour of Vietnam’s most spectacular destination, check out this traveler’s guide to Halong Bay which will answer all of your questions about this wonder of Vietnam. Hanoi will not only amaze you, but will also steal your heart. Get your bags packed! 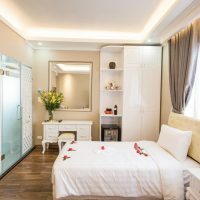 As you can see, there are some incredible things to do in Hanoi just waiting for you to tick off your list. Have you visited the city already? 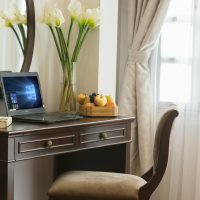 What other things to do in Hanoi would you recommend? Leave your comments below so that others can add them to their itinerary. The pagoda in Tran Quoc is consider to be one of the cultural symbol in Vietnam. If you’re planning to go here make sure to wear modest clothes, like pants, pajamas, long sleeves or any modest clothes for you to be allowed to enter the sacred place. Yes, agreed. Thank you for sharing. 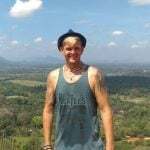 i will visit Vietnam at Feb. it is really useful to me. thanks for sharing.